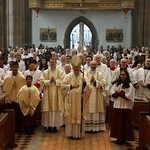 It was a sight to behold at St Chad's Cathedral on Saturday (9 Feb) as hundreds of altar servers from across the Archdiocese gathered together. The Guild of St Stephen Annual Mass of Thanksgiving was extremely well attended by altar servers and their families. Servers came from all parts of the diocese, some with priests and deacons from their parish as well as family and parishioners. This year, Mass was served by those from St. Marie’s, Rugby. His Grace, the most Reverend Bernard Longley, celebrated Mass. The Guild of St Stephen is an international organisation of altar servers, founded in England in 1904 by Fr Hamilton McDonald. The Guild has spread and developed since then. The objectives of the Guild are: To encourage, positively and practically, the highest standards of serving at the Church's liturgy and so contribute to the whole community's participation in a more fruitful worship of God. To provide altar servers with a greater understanding of what they are doing so that they may serve with increasing reverence and prayerfulness and thereby be led to a deepening response to their vocation in life. To unite servers of different parishes and dioceses for their mutual support and encouragement.